"I am blown away by the courtesy and professionalism by the whole staff at Madwraps. We love our new truck design for sure! And even more the quality of work and friendly service we received...."
It's all about a successful installation. 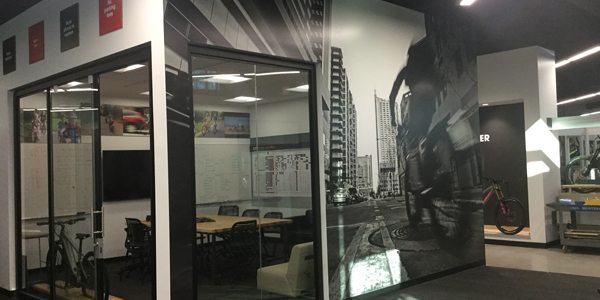 Have your custom wall wrap professionally designed, printed and installed by our incredible team. Our goal is to be a minimal invasive in your space as possible leaving it clean when we leave. Low VOC paints are driving change in wall film applications. The chemistry of paints has been changing over the years to drive down the level of Volatile Organic Compounds, VOCs, due to both sustainability efforts and regulatory requirements. These new paint formulations have changed how the painted surface interacts with the adhesive on films, affecting the films' ability to adhere to the paint. Simple steps can maximize film adhesion. Because the paint formulations are protected by trade secrets, it is difficult for any film manufacturer to understand how film adhesives interact with these paints. We have found through extensive testing that there is no single film or adhesive that works “best” on each paint tested. In fact, one film can perform well on one paint and poorly on another paint. However, by using the new 3M Enhanced Adhesion Cleaning Method and testing the film's adhesion to the walls, we can quickly, easily and successfully adhere almost any 3M wall film to nearly any paint.